This is a drawing of a dog called Baci. This portrait was commissioned to be used as a gift the the dog’s young owner. The drawing has been modified slightly en relation to the reference photo, where the dog is wearing a bright red vest. The drawing is done on watercolor paper in A4 size. 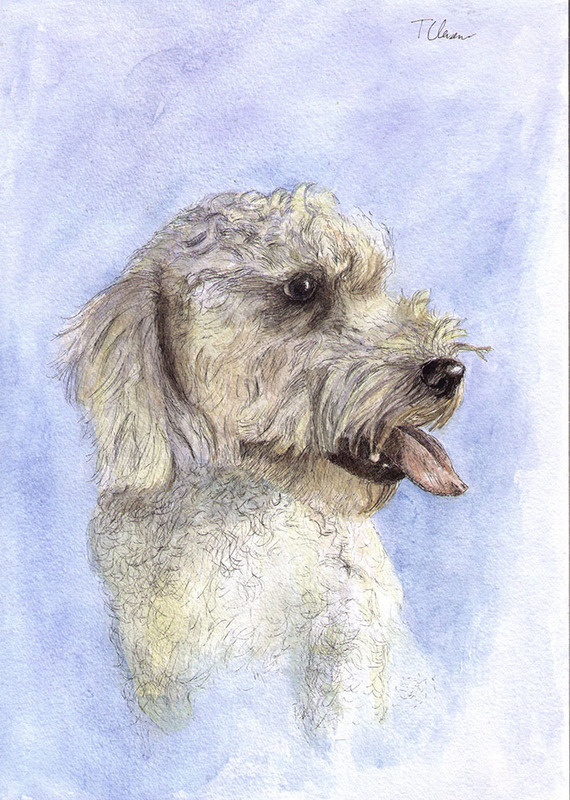 Tagged Ballpoint pen, commission, dog, Drawing, Featured, painting, WatercolorBookmark the permalink. You did a fab job here! What a cute dog! Thank you very much 🙂 Glad you like it! Why not at all 😉 Thanks a lot! Yes I remember trying to draw a polarbear with a black pen a couple of years ago, and ended up with something that looks like an oil spill victim! Lol! This is beautiful and the tongue is perfect!! One of mine who passed was black and they are so hard! Very nice! I love your pen work here, particularly the curvy strokes used on the dog’s body! For me that gives it a nice something….not sure what it is..cute touch (?). I also love the blue background and how the dog’s legs merge with the background. Thank you very much! I’m really glad you like it!